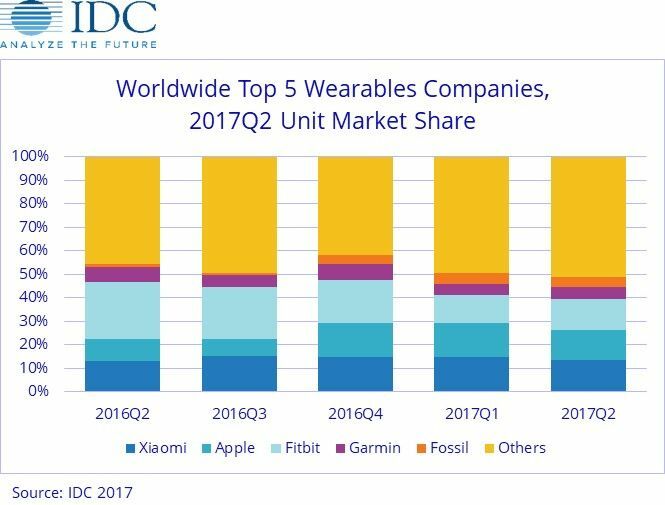 FRAMINGHAM, Mass., August 31, 2017 – The worldwide wearables market was once again graced with positive growth as shipments grew 10.3% year over year, reaching 26.3 million during the second quarter of 2017 (2Q17), according to the International Data Corporation (IDC) Worldwide Quarterly Wearable Device Tracker. The quarter also marked a turning point in the market as basic wearables (those that do not run third party apps) declined for the first time with annual growth of -0.9%. Meanwhile, smartwatches like the Apple Watch and Android Wear lineup grew 60.9% in the quarter thanks to fitness and fashion enthusiasts. "The transition towards more intelligent and feature-filled wearables is in full swing," said Jitesh Ubrani senior research analyst for IDC Mobile Device Trackers. "For years, rudimentary fitness trackers have acted as a gateway to smartwatches and now we're at a point where brands and consumers are graduating to a more sophisticated device. Previous niche features such as GPS and additional health tracking capabilities are quickly becoming staples of the modern smartwatch. Just a year ago only 24.5% of all wearables had embedded GPS while today that number has reached almost 41.7%. "Equally important to device features will be the algorithms tracking workouts and providing health insights," continued Ubrani. "There is growing interest from the medical industry to adopt wearables and consumer expectations are also on the rise. This is where companies like Apple and Fitibit have the potential to maintain their lead as their investments in the tracking and perhaps diagnosing of diseases will be a clear differentiator from low-cost rivals." "Market growth favored new and emerging products in the second quarter," noted Ramon Llamas, research manager for IDC's Wearables team "Smartwatches recorded double-digit year-over-year growth, with much of that increase attributable to a growing number of models aimed at specific market segments, like the fashion-conscious and outdoor enthusiasts in addition to the technophile crowd, lower price points, and a slowly-warming reception from consumers and enterprise users alike. Factor in how smartwatches are taking steps to become standalone devices, and more applications are becoming available, and the smartwatch slowly becomes a more suitable mass market product. "Meanwhile, we also saw triple-digit growth from clothing and earwear," continued Llamas. "These products are still in their initial stages, but by targeting specific market niches (performance tracking clothing for professional athletes) or providing unique value propositions (audio adjustment or language translation for earworn devices), these products are offering solutions to problems other than simply reporting data, and gaining traction." Xiaomi maintained its lead in the second quarter as the company's expertise in driving low-cost devices remains unmatched. Though the Mi Band lineup was the most popular, Xiaomi also caters to the growing market of kids' devices and recently shipped its first pair of smart shoes under the Mijia brand. Shipments for the shoes were immaterial during the quarter though IDC anticipates this to gradually grow as Xiaomi gains traction in the clothing/apparel industry. Apple 's growth continued to outpace the market as the Series 1 and Series 2 are now mature products with the clear and concise purpose of fitness. This has boded well for Apple as the company has been slowly expanding its reach among health insurance providers. The release of the latest Watch OS later this year is also expected to bring much anticipated features like Siri to the wrist. Fitbit finds itself in a period of transition. Early leaks and the recent official announcement of the Fitbit Ionic will help cement the company's place in the growing smartwatch market. However, short-term growth remains challenged as the product portfolio is vast and undifferentiated. Garmin 's decline of 6.6% from last year should not necessarily be seen as a negative as the company has managed to grow revenue. Transitioning existing users from basic fitness trackers to more advanced smartwatches like the Fenix lineup has worked well for the company. Recent developer outreach has also allowed Garmin's ConnectIQ platform to branch outside health and fitness. Fossil entered the top 5 for the first time and much of this is credited to the acquisition of Misfit in late 2015. With a large distribution network of fashion stores and multiple brands Fossil managed to attract a previously unaware audience to the wearables market. While smartwatches from Michael Kors and Fossil took center stage, the company's hybrid watch lineup also gained traction.